Now that Janmashtami is approaching fast most of you must be busy preparing goodies for Sri Krishna and of course family & friends. As I mentioned in my Janmashtami Recipes Collection post we normally do fasting on Krishna Jayanthi and it's full day fasting with eating only after mid night or some time consume only fruits. 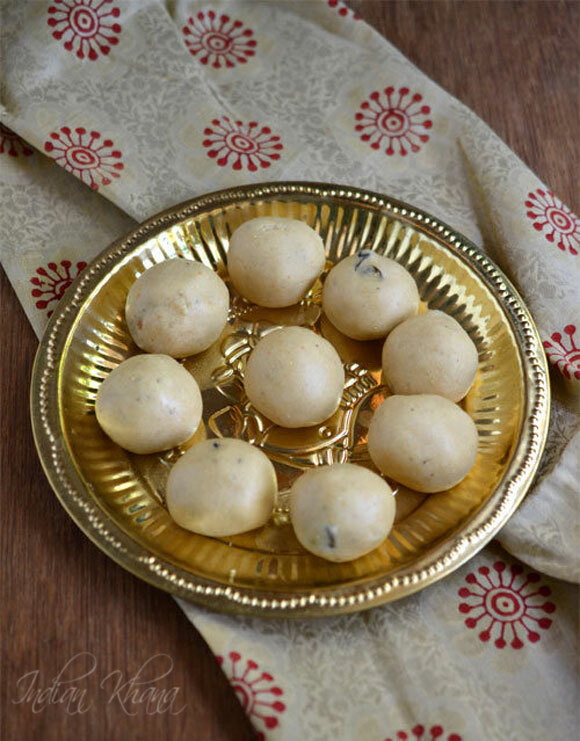 But to share with friends, family or neighbor or for Naivedyam we prepare sweets and snacks in my house coconut laddu, murukku, singhara burfi or laddo is made. 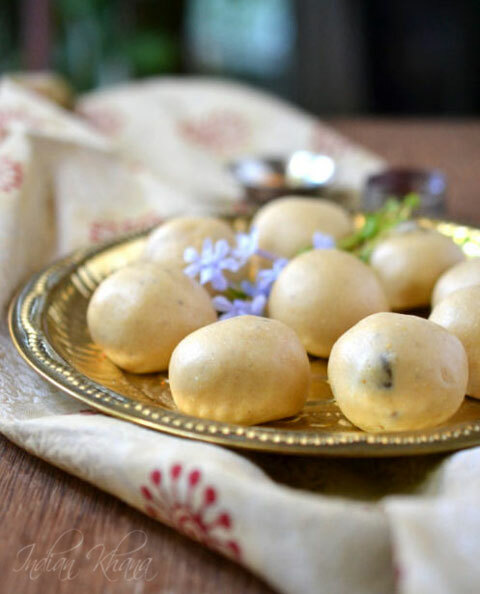 I prepared this easy and quick maaladu or roasted gram (chana dal) ladoo to share with you all and also to celebrate happy occasion of our (DH) nephew graduation, it's one of the happiest moment. 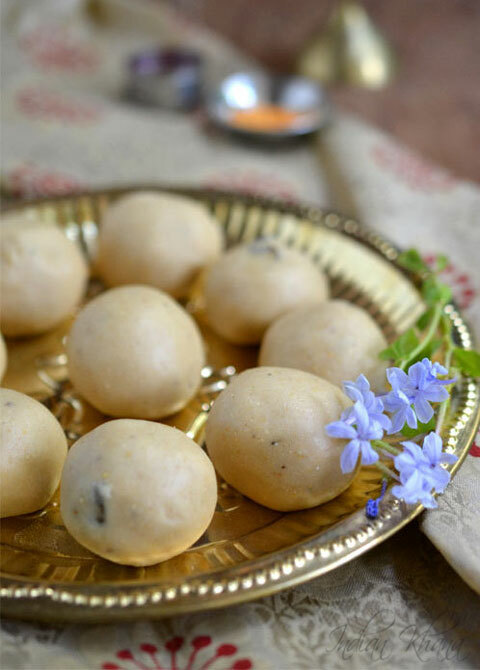 Maaladu or Pottukadalai Urundai or roasted gram laddu whatever you choose to call it is one of the easy ladoo recipe to try. 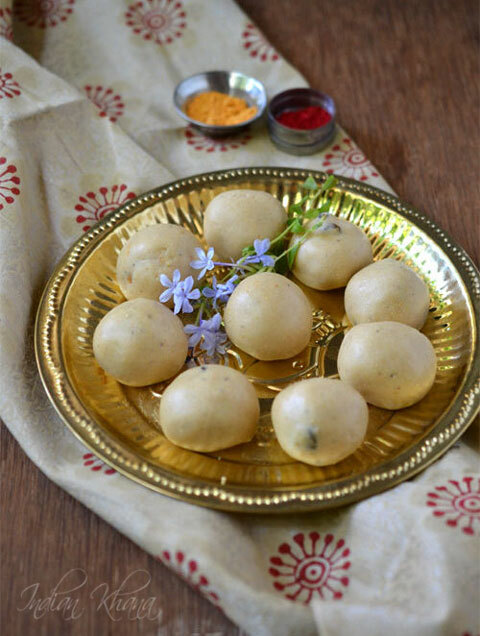 It can be done in jiffy without much hassle and it taste similar to besan ka laddu. 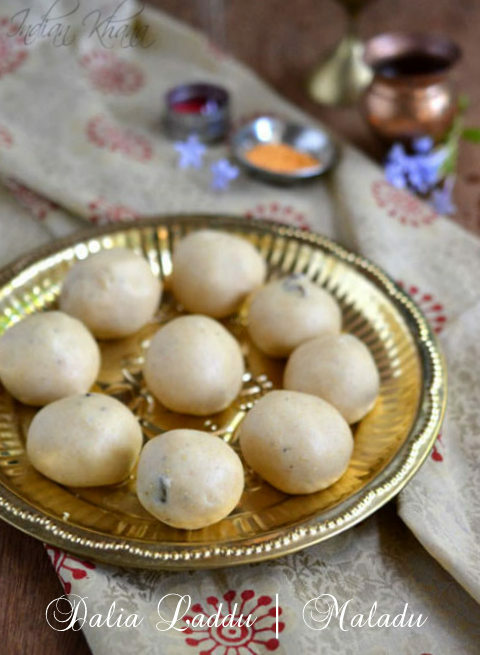 If you have last minute naivedyam to prepare or want to try something new then maaladu/putnala pappula ladoo is one of best option it's made with only few ingredients with minimal cooking too. If you crave for besan laddu but don't want to prepare that as it's takes little time or this dalia ladoo is good alternative. 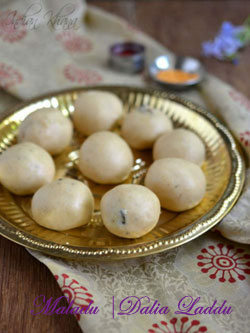 Try this for any festival and everyone will like it, for other Janmashtami recipes click here. Maaladu/maladoo is a famous South Indian sweet also knows as Pottukadalai Urundai or Dalia Laddu is made to celebrate any festival. Clean dalia/roasted gram (chana dal) and grind into fine powder and sieve it to remove any dal piece left. Grind Sugar with cardamom seeds into find powder. Heat 1 tsp ghee in a pan or wok and saute raisins and cashew nuts until golden brown, keep aside. In the same pan add powdered roasted gram flour and saute for 1-2 minutes with continuous stirring or until raw smell goes. Do not over roast to avoid burning or to make the flour brown, off flame and allow flour to cool. In a large bowl add roasted flour, sugar powder, roasted nuts and mix well, add melted ghee and mix well to combine everything. 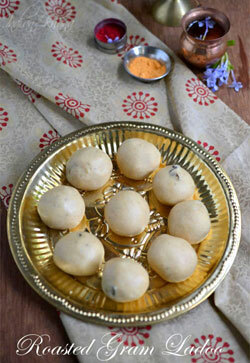 Take small amount mixture in hand, make laddu with pressing & routing to shape in balls repeat same for rest of flour mix. Store in air tight container and serve as required.